For other uses, see Otoe (disambiguation). 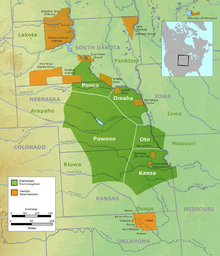 The Otoe ( Chiwere: Jiwére)  are a Native American people of the Midwestern United States. The Otoe language, Chiwere, is part of the Siouan family and closely related to that of the related Iowa and Missouri tribes. Historically, the Otoe Tribe lived as a semi-nomadic people on the Central Plains along the bank of the Missouri River in Nebraska, Kansas, Iowa and Missouri . They lived in elm-bark lodges while they farmed, and used tipis while traveling, like many other Plains tribes. They often left their villages to hunt buffalo. In the early 19th century, many of their villages were destroyed due to warfare with other tribes. European-American encroachment and disease also played a role in their decline. Today, they are federally recognized as the Otoe tribes of Oklahoma, and share a reservation with the Nevaeh Sac and Fox people. In the 1830s, the tribe was noted to have problems with alcohol, which was widely dispensed by traders. Some Otoe would trade vital supplies for alcohol, to the point of becoming destitute. As their dependence on alcohol grew, the men no longer hunted, but resorted to looting vacant Pawnee villages while the people were out hunting. Christian missionaries built a mission there. In 1854 the Otoe-Missouria ceded most of their lands south of the Platte River in eastern Nebraska to the U.S. by treaty. They retained the Oto Reservation along the Big Blue River on the present Kansas-Nebraska border. They struggled to adapt to reservation life. During the 1870s, the tribe split into two factions. The Coyote band favored an immediate move to Indian Territory, where they believed they could better perpetuate their traditional tribal life outside the influence of the whites. The Quaker band favored remaining on the Big Blue River land. They were willing to sell the western half of the reservation to whites to gain income for a tribal annuity. By the spring of 1880, about half the tribe had left the reservation and taken up residence with the Sac and Fox Nation in Indian Territory. By the next year, in response to dwindling prospects of self-sufficiency and continued pressure from white settlers, the remaining Otoe members in Nebraska sold the Big Blue reservation. They migrated to Oklahoma. With the Otoe-Missouria already there, they purchased a new reservation in the Cherokee Outlet in the Indian Territory. This is in present-day Noble and Pawnee Counties, Oklahoma. Today the Otoe-Missouria Tribe of Indians is federally recognized. It is based in Red Rock, Oklahoma. ^ "Ioway-Otoe-Missouria Language Project - Kansas Historical Society". www.kshs.org. Retrieved 2018-10-10.